Get it in writing! Avoid not getting essential paperwork or other items on a trade or when delivering a vehicle. 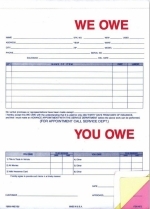 This form insures that the customer also knows what they owe you. Each form is 3 part snap-out. Forms are carbonless - white with canary and pink copies. Copies print in blue & red ink. Form size is 8 1/2 in x 11 in. There is no selection of starting number for plain forms. Imprinted forms are also available - see next item. 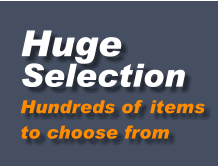 Priced and packaged 100 forms to a package.